Display and Store your Jewelry in this stylish animal inspired Jewelry box. The case features compartments to neatly organize items. The case includes space for 2 watches, a removable tray, and bottom compartment to store additional bracelets, necklaces or pendants. The box also includes an elastic pocket to store a variety of items, such as pearls, tennis bracelets, and small pendants. 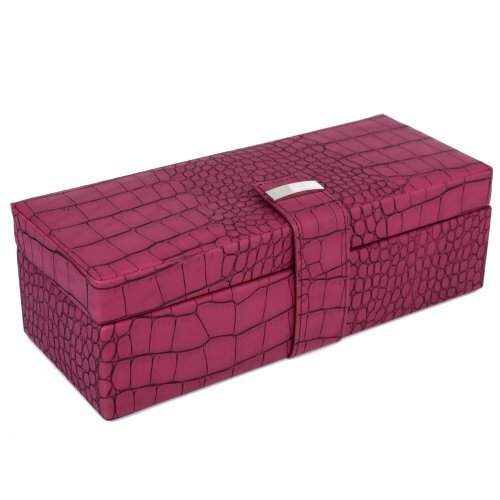 The box measures 4 inches deep, 3.25 inches high, and 10 inches wide and is crafted with a soft cream colored interior lining. The box is designed with an animal print motif in mind. Crafted from beautiful maroon wine sangria colored faux leather material that is easy to clean and stain resistant. It is embossed in animal print design and enclosed with a modern tab and engravable silver colored hardware enclosure. Also has a matching Watch box for 5 watches. If you have any questions about this product by Bucasi, contact us by completing and submitting the form below. If you are looking for a specif part number, please include it with your message.